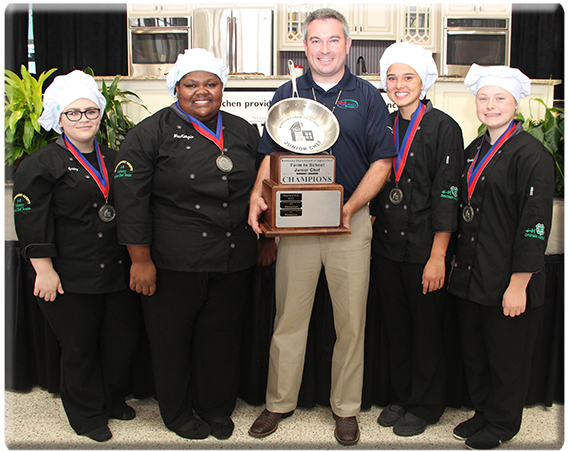 LOUISVILLE, Ky. — Montgomery County prevailed over Boyle County by a knife’s edge in the fourth annual Farm to School Junior Chef championship cook off Friday at the Kentucky State Fair. The Montgomery County team of Hayden Holley, Joy Pidgorodetska, MacKenzie Green, and Gabby Hovatter prepared Farmer’s Choice Dirty Rice to win over a panel of three judges from Sullivan University. The Boyle County team – Sidney Darnell, Samantha Stewart, Mady Thomas, and Chandler Lane – prepared Barbeque Pork Tacos with Apple Poppy Seed Coleslaw to reach the final match. Each Montgomery County member won the opportunity for an $8,000 scholarship from Sullivan University plus cook books and a $150 cash prize from John Wiley & Sons. John Wiley will provide its text books free of charge to any Montgomery County member who enrolls at Sullivan. Montgomery County will demonstrate its dish at the first Farm to School Southeast Region meeting in September in Greenville, South Carolina. Each Boyle County member won the opportunity for a $5,000 scholarship from Sullivan. Members of Pikeville Independent and Henderson County, the other semi-finalists, each won the opportunity for a $3,000 scholarship from Sullivan plus cook books. Hayden Holley was named Top Chef of the tournament and won an additional $2,000 scholarship offer from Sullivan and a cash award from John Wiley. The Junior Chef season begins with district competition in the spring and continues with regional matches to determine the teams that will advance to the state tournament. Junior Chef teams are made up of three to five students in grades 9-12. The Farm to School Program and the Junior Chef competition are administered by the Kentucky Department of Agriculture. For more information, contact Tina Garland, the KDA’s Farm to School Program Administrator, at (502) 382-7505 or tina.garland@ky.gov, or visit kyagr.com/junior-chef.